While pectin alone certainly has a number of health benefits, apple pectin in particular has some additional advantages. Apple pectin’s primary medicinal use is as a natural remedy for digestive disorders. Since apple pectin is high in fiber, it is used to help regulate bowel movements. It can help firm stools and reduce inflammation associated with diarrhea, as well as help with constipation. It is also used to help treat colitis, irritable bowel disease, and other related digestive disorders. This is one reason why you’ll find it as an ingredient in Jon Barron’s Colon Regenerator™ formula and other medications aimed at treating bowel disorders. In addition to helping the digestive system, apple pectin has also been shown to help with overall heart health. In studies of apple pectin, it has been shown that it may help lower total cholesterol levels and triglyceride levels. It can play a role in controlling your blood-sugar levels as well since it helps slow the digestion of sugars and fats. Interestingly, the consumption of apple pectin via the whole fruit has been shown to provide greater benefits than through a supplement alone. Another interesting study of apple pectin confirms yet one more reason why it pays to eat your fruits and vegetables. As it turns out, the pectin protects against cancer. While apple pectin benefits have been known for some time, this particular study sheds light on how pectin works specifically in fighting cancer cells. A research team at the Institute of Food Research in Norwich, England, discovered that a substance in pectin binds to a tumor-producing protein called galectin 3. Galectin 3 allows cancer cells to detach from tumors and to reattach elsewhere, and so it's a major factor in the spread of cancer. But pectin blocks the activity of galectin 3 and, in so doing, may prevent the progression of cancer within the body. Studies have confirmed that apple pectin benefits individuals combating cancer in other ways as well. A research team at the University of Georgia found that pectin destroyed up to 40 percent of prostate cancer cells upon exposure, while other studies revealed that pectin helps in fighting lung and colon cancers. And in fact, apple pectin was used after Chernobyl to extract radioactive waste from victims. Other benefits of natural pectin include protecting against gallstones, ulcers, colitis, constipation, diarrhea, and diabetes damage. Pectin removes "unwanted toxins and heavy metals (mercury, lead, aluminum, etc. ), and, as just mentioned, reduces the side effects of exposure to radiation." 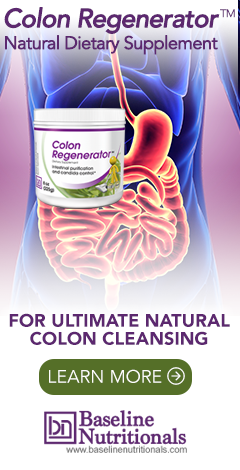 It binds water and toxins together and bulks the stool, and thus carries toxins from the body. Again, these are all reasons why you’ll find apple pectin as an ingredient in Jon Barron’s Colon Regenerator™ formula. You may know pectin as a substance used to solidify jams and jellies, and so the question arises: does "jamming" yourself full of jam protect you from cancer? Probably not so much. The researchers point out that while the process of making jam may activate the "good" effects of the pectin and provide some protection, the high sugar content and additives in commercial jams would most likely counteract the benefits (a good reason to choose all-fruit jam). While scientists continue to dissect, isolate, and modify the stuff to make it "better," you can get your fill of pectin by eating plenty of raw vegetables and fruits and an occasional gob of all-fruit jam. To increase your intake even more -- and especially to reap benefits such as protection from cardiovascular damage, hypertension, and cancer -- go to the health food store and peruse the selection of pectin supplements. You can also get pectin working for you by doing an intestinal cleanse that contains pectin -- or using such a formula as part of a daily maintenance program. Learn more about preventing cancer here. Hello, yeah this piece of writing is really pleasant and I have learned lot of things from it about blogging. thanks. There is certainly a lot to find out about this issue. I like all the points you've made. At this moment drinking left over quince juice. From jelly i made.It's so thick. Was going to freeze it but decided down the hatch! Warming a thickened pectin mixture will thin it down so it's easier to drink. I have taken apple pectin in a pill form for years to rid my eyes of 'floaters', those black spots that form which one suddenly becomes aware of when looking at a white wall or a blue sky. It always works. Might take a week or two, but it always works. Thank You for the information about apple pectin and floaters I will definitely give that a try. I wonder if the liquid or powdered pectin that I have used to make jams and jellies over the years will be as effective as what can be bought in health food stores. I would certainly be cheaper. I was told long ago to relieve stomach distress by peeling an apple, shred it.or slice very thin, wait for it to get brown (forming more pectin?) then eat it. I make my own from the apple peels and cores and then can it. I drink a little bit each day.